Pains me to admit, but it’s been weeks. Weeks! I know, shame. Fully-stocked fridge. Equilibrium restored. What to make? Searched for recipes online, flipped through a few cookbooks, peeked in the cupboards… and there, two yukon gold potatoes about to sprout their own, made the decision. Potatoes. Curry. Noodles. Prawns. Spice paste. Singapore Laksa! Well…my version of Singapore Laksa. I don’t follow recipes well. 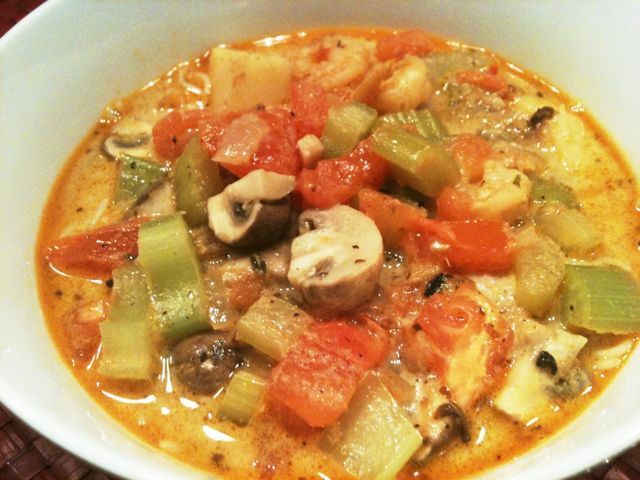 And ultimately, throw what I like into a pot…and taste-test until satisfied. Also, too impatient to snap pics as I go. 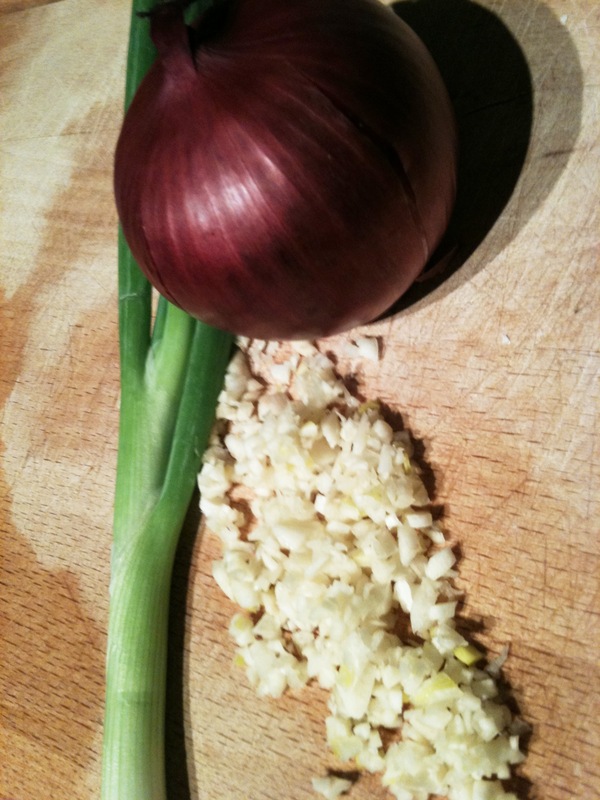 So, here’s one at the beginning – garlic & onion. big mound of it. love my garlic. Roommate comes home to find soundtrack of Glee blaring (don’t judge), kitchen a complete disaster (organized chaos), slight burning smell (yep, burned bottom of one pot) & one happy asian slicing & dicing to add to simmering pot of…. yum! Bless her heart, not even a toe into the kitchen. Probably too scared. Yep, what my lovely roommate does to unwind after a hard day at work. Give her a cloth, some Windex & she’ll attack your hard surfaces as well. Pretty freakin’ amazing. 20 min later – after vacuuming has finished, but before mopping of the floor commences – I’m spooning spicy coconut curry broth over noodles…dinner is ready! Verdict? Ooo, so good… x 2. Throw in prawns. Cook at medium heat until pink & ready. Set aside. fyi: leftovers with steamed rice tomorrow…come drop by. 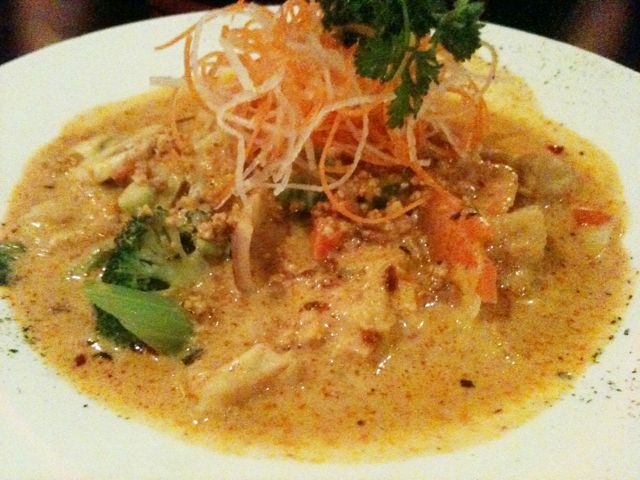 Rave reviews put this little thai resto on our must-try list. So we went. Oh la. 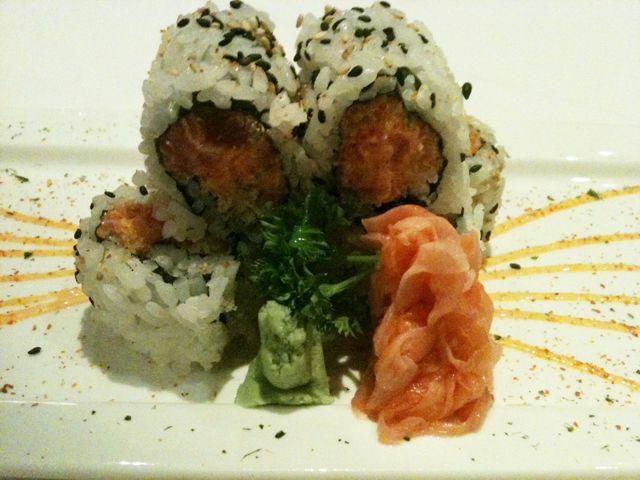 Spicy & flavourful…just the way we like it. Masaman curry was delicious. Fragrant & sweet, with a heat that lingered. High expectations for the red curry. Will always be that way after Mengrai. And…it was close. 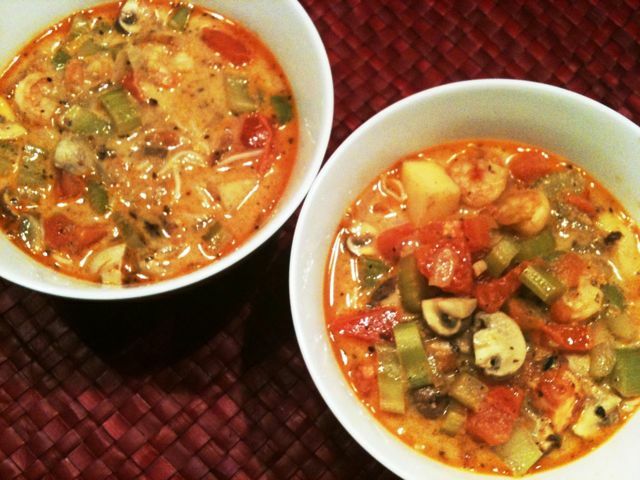 Gaeng Phed: Red Curry with squash, kaffir lime leaves, basil leaves, red & green pepers & coconut milk – with tofu. Tom Kha Gai: Creamy coconut, chicken soup, with fresh cut herbs. Galangal, lemongrass, kaffir lime leaves, coriander, onions & tomatoes. 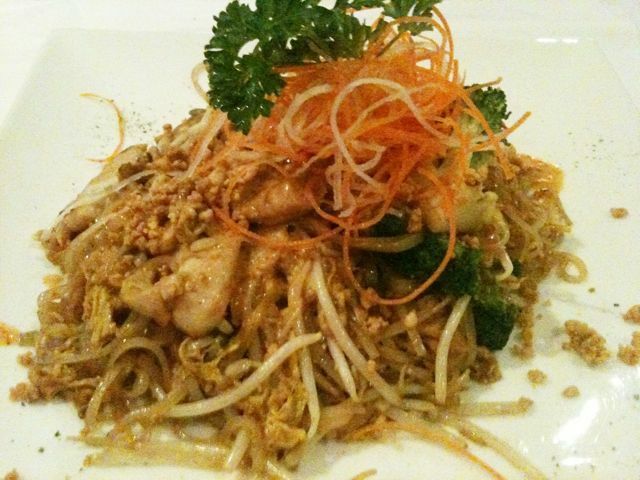 Pad Kee Mao: Savoury, hot and spicy stir-fried rice noodles with a choice of chicken, beef, tofu or shrimp. 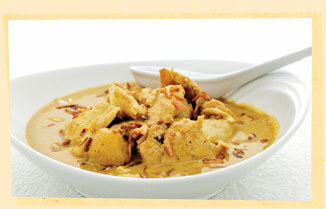 Gaeng Panang: Panang curry with kaffir lime leaves, basil leaves, red and green pepers and coconut milk.